But seriously, it’s interesting to read your perspective. I used to travel every 2 to 3 weeks and it got to feeling like an addiction. Now I’m older and more settled and I look back on that time as fun and exhausting but not something I want to do anymore. Having 6-7 foreign trips planned for the remaining part of the year that will undoubtedly have some luxury element is still a lot of travel, more than most people will do in a lifetime. That said, the perspective you mention is good and it does resonate. Thank you for sharing your thoughts and I’m glad you are finding a happy and healthy mix of travel and home life. Congratulations!! Surprised it took this long for you to burn out. ive been following your blog for years. I’m at the same point as your are and age wise similar as well. and youve really hit a point. i had this crazy goal to visit 100 countries by the time i was 30, and now that ive done that, traveling for me has changed. while i still travel a lot comparatively to other people, im finding it less and less of priority. thanks for this post and for all your insights over the years. Dogs! I had a trip planned this week to Hawaii. The 737MAX flight got cancelled, sure with rescheduling, I would have got there with delays. But I was worried my 1-yr old dog would have to stay longer in boarding kennel. It was easy for me to just decide to stay home, take a local road trip with my dog, and husband, and enjoy our time off stress free. I love flying! But I hat leaving my dog in a kennel. I totally empathize with you. I’ll probably fly less often, but I still love to travel! Definitely your travel desires, and the need to be always on the go, changes through time. I used to be on the road up to 70% of the time, and I enjoyed it back then, but not anymore. As I have grown older, it has become more about the whole experience of being in a place, getting to know people, having some roots somewhere, rather than the constant movement. Granted, still enjoy traveling in business class cabins, and luxury hotels, etc, and plan on continuing doing that, just doing it to a lesser extent, is perfectly fine. Couldn’t agree more with what you said. I used to love taking detours, especially in premium classes….LAX DFW NRT. These days, I hardly eat and don’t drink alcohol inflight. Heath becomes a priority. No amount of first class travel can compensate for good health. In my 20’s I aspired to making enough money to buy plane tickets for anywhere in the world. In my 30’s I aspired to making enough money to fly anywhere in business class. In 40’s I aspire to making enough money that I can stay home when I want to and travel only when I want to. Same, getting a dog was the number one thing that settled me down. I still love the miles hobby and go on crazy trips (India for just a week next month) but I can’t imagine that “on the go” feeling anymore, and I would have happily lived out of hotels before getting my boy. He travels well but he couldn’t practically travel the whole world. BTW: Have you thought of writing a book about your (crazy?) life? You are a fine writer, and I don’t doubt it would be a great read. Great post, Ben! Always appreciate your honest vulnerability. And Winston is adorable! Rescue dogs are the best. I’d love to see a future post about services like Wag or Rover, i.e., doggie care apps for when you’re unexpectedly away from home (such as due to a flight disruption) and need coverage when the dogsitter’s unavailable. Lucky, thanks for sharing. I think it’s a good reminder that being content is so much more about who you are with and how you feel than where you are (geographically). I’m a few years older than you and have a 1 and 4 year old. I recently took a fairly senior role that has me on the road about 2-3 times a month for 2-4 nights. Leaving my kids is more difficult than I ever would have imagined and while I love travel and am forunate to stay in nice hotels and eat at solid restaurants etc. I certainly don’t get the “thrill” out of it I would have if I was younger. The upside is that I get to take my family to some great places as a result (both due to points and if they tag along with me on some trips to places they want to go etc.) and those moments are very special. So having kids will absolutely change things that much more for you, but then you’ll also get to share your passion with them which is very meaningful. I will enjoy reading about that on the blog as well. (“Lucky’s top ten travel strollers” ). Anyway, as they say, everything in moderation…cheers. Self reflection is worthwhile and it seems you are making choices for good reasons. Of course it’s always possible you will change again, but its good to periodically ask yourself “why am I doing X? is it really what I want?” Good for you. Age takes a toll: jet-lag takes longer to get over, the very act of travelling becomes more draining. I travel for my work, with a long-haul trip every 3 or 4 weeks. It now takes more careful planning: I make sure I arrive with time to spare to relax and recover a little. I don’t increase stress levels by having short connections – I try to take more leisurely options. I split the trips up (a couple of years back I did London to Miami for 3 days, then to Taiwan for 5 days via London and Dubai. By the time I got to Taiwan I was so exhausted I spent 2 of my 5 days being ill. Which was no use to anyone. So I don’t do trips like that anymore). But like you, my dogs are making it difficult. I have greyhounds: the male seems to recognise about a day before I leave that I’m going to go. He silently follows me from room to room, standing very still at a short distance while staring longingly at me. It’s utterly heart-wrenching. But it has to be done, to keep him in the lifestyle to which he has become accustomed. And he has a regular dog-sitter who he likes. Though the most irritating thing is people who gush that I must live visiting all these exotic places. Yeah, I can describe the cab journey from the airport to the hotel, and back again. It isn’t at all glamorous. Hence my obsession on here with consistency of brand and non-stop flights. Anything to make it easy. Is he on an United Polaris comforter? My pug Ronnie got to sleep on a Polaris comforter as well. Dogs are a good reason to stay home. Thanks for sharing! I remember when you posted a little while ago that you guys settled down in Miami, I thought that it was extremely likely that it wouldn’t be long before you discover the joys of staying home with your loved ones (including pets – we have cats and when we travel it’s heartbreaking to leave them so I can relate! ), and simply having a routine, habits, and a place to call home. As boring as it may sound, it can be very soothing especially given the lifestyle you’ve had so far. I think it will be far more sustainable for you now, especially health wise, and I think you might enjoy your travel far more now by being able to anticipate it and making it more purposeful. Nice Polaris blanket that dog has. @ Zach — He’s some kind of a terrier mix. Still need to do one of those DNA tests. Ben, Im a few years older than you, and it’s amazing how age changes how you feel when flying. When I was younger, flying was my relax time. I was able to fall asleep in any coach seat in an instance. Reading a book for 5 hours was great. IFE as well. I had no issue with 12 hour flights. Red-eyes were perfect because I could start my day at 6am fully refreshed. Recently, I found myself on a 12 hour flight walking back and forth around the rear restrooms because I was so sick of my seat. Now I need an entire rest day after that kind of flight, and adjusting to time zones is getting harder. I’d rather spend time with my dog than most human beings. Good choice Ben! Age is what kills the “again! again!” muscle, no matter what it is we obsess over in our youth. It’s a good thing. It keeps us from all becoming 50 year old wierdo’s with massive McDonalds happy meal toy collections. Congrats Lucky! I’m happy for you! And don’t worry, i’ll Still be checking the blog an ungodly number of times each day. I think taking breaks is critical. I traveled constantly for about 10 years, then I didn’t for 5 years, then I was back on it for a couple years. Now I travel in bursts and I vacillate between wanting to be home and inert and itching to get out of town. But, hey, here’s an add for your “to try” list. Corsair has a lie flat business product you haven’t reviewed. Just happened to notice it amidst coverage of them being sold off by TUI. You’ve hit the road so long & hard, Lucky, it seems you just better know what you like & where you best like to do it. That you no longer have to waste time experimenting as much because you know your own self better. You’ll still have those scratch that itch adventure moments but slowing down a minute to reflect, enjoy, & heal is equally important to your growth & wellness. Blessings to you, Ford, & Winston. Looking forward to some Florida posts! Can he be your emotional support dog and travel with you? Get him a Pawlaris collar and how could United refuse?!! Ben, I am also a travel writer. One of the things I’ve found as I’ve gotten older is that it’s less about the travel and more about the life. I’m just finishing up three months living in France, where I only had one transoceanic flight. It’s hard to remember three months I’ve ever been anywhere, and I love it. I still get the amazed feeling of being somewhere new and learning, but also have the relaxation associated with not having to always be rushing off somewhere else. Perhaps this is a way to have and eat your cake? Thoughtful post. Everything changes once you have kids. I have been an avid traveler since my early teens. I took a break once my first kid was born that lasted several years. Once my youngest was 3, we started back up again. At this point I have realized that home is where my core family (husband and kids) is. My kids get so much out of traveling – it lets them know that there is more out there than just their immediate community. It also brings us closer together as a family…there are no errands or commitments while out on the road – only each other. You are at the stage in your life where you are ready to nest and have a family…this may also change in a few years as it did with me. Nothing in life is static. looking forward to in-cabin pet travel analysis! I don’t travel nearly as much as you do (no one does), but I have to admit to being a bit less enthused about going places than I used to. I think that might be because I do spend a lot of time in one particular part of the world (SE Asia) and now that I’ve been to most of the places I want to see there it doesn’t have quite as much allure. I guess it’s time to start looking to other locales. Traveling for a day to get there and back is more tiring than it used to be, even “up front”. Love this, Lucky! Thanks for sharing. Interesting to see this side of you, Ben. My story is that I am 53, have traveled virtually non-stop since I was 22 and am still clocking in at 250 nights a year on the road. I never lost the desire and I still get antsy and ornery if home for a week. The difference is that the travel ITSELF is not my job like it is for you. My purpose is two-fold: I travel to make deals (and get that thrill when doing so) or I travel to harness my passion for whitewater kayaking in odd places around the world (yet another thrill). So maybe for me it’s not that travel in itself is exciting as much as a means to an end in harnessing an addiction to the adrenaline that deal making and my personal passions provide. It sounds like Miami is being good to you as well. Miami is such a wonderful multi-cultural and city that it can, when you get to know it, tame a bit of the wanderlust as it feels different from the rest of the country in so many ways. Good for you guys. You know I’ve been reading your blog for several years now, but this has to be one of the single most important and refreshing posts – E V E R.
I’ve oft thought back to the comment one of your readers gave to you as to why people travel and I’ve always disagreed with it. People travel for many different reasons and not for longing for ‘finding’ the ‘perfect’ place. The reason I bring this up is precisely tied to your post today: Perspective. Travel provides a litany of lessons, though for us it has always been to put life in perspective – both from how we enjoy ours here at home juxtaposed to how others live theirs – and are happy doing so – in their homes abroad. Like you, we are still amazed at how equally important the journey is as the destination. We had a dog – who passed away not too long ago – that was our first child. He was priority. We never – nor would we ever – board him at a kennel. We had lovely friends who house-sat for us, had a relationship with our fur-child, and who took him to doggie day care most days while we were traveling. He loved it, but he also knew all of the verbal word and body language leading up to a trip. We talked in spelling words and hiding suitcases, and carefully planning the transition so he was just as excited to have one of his aunties come over as he was concerned about us leaving. This special relationship that only dogs can provide is actually one thing that always made us appreciate travel MORE. That may seem counter intuitive, but as much as we loved flying off to explore the world, we also enjoyed coming home because we had a loved one depending on us to do so. Balance. Perspective. Love. Because of this, we still love travel. Perhaps its because we did it in moderation (my job allowed for plenty of travel, but never weekly and it was never excessive), and it provided us the ability to travel well. Glad to see that Winston has, for lack of a better word, grounded you and Ford to a perspective that you don’t have to give up what you love (or addicted to), to give love to those closest to you. Enjoy this new perspective! Great post, feel free to reach out if you need any tips for Ireland. This legit made me tear up. I think it was the dog’s backstory and the pic combined. Good for you, Lucky. I’m sure you’ll keep making enough content to keep us interest. And agree on how great it is to come home to a happy dog! I remember meeting you for the first time in San Francisco 12 years or so ago. You were an adorable teenager who was so enthusiastic about the travel game. I also remember the entourage of adorable young (nerdy) fellas that worshipped you! It has been a pleasure to witness you grow into an adult and look ( somewhat enviously) at what life has brought to you. I have resisted getting a pet because of the restrictions that would place upon me and also to avoid the expense and heartache that comes when that pet gets old/sick and dies. Been through that a few times and it is not something I want to go through again. The Points and miles game is not anywhere as fun for me as it used to be. Between the airlines and hotels demanding more for less and my body not being able to let jet.lag and fatigue roll off like it use to it has become a drag. I also now have to spend the money I used to spend on travel on health care now. One brings me joy the other is a necessity. P.S. your Poochie is adorable! I’m in quite the opposite situation. I’m 30, and have been trying for the last 10 years to be a road warrior. I’ve yet to come anywhere close to that, even having worked for a major tech company. I’m at a point in my life right now where I can be flexible and enjoy always being on the go. I know that in 3-4 years from now, I’ll be ready to settle down and not do this. But its’ frustrating because I know the time is ticking for how much longer I could potentially do this. Representing the single, dogless demographic, I have to say that friends can be your chosen family. As I’ve grown into my 30’s I have realized that spending time with them does wonders as far as quality of life. I was a travel addict in my 20’s, then I got a job that moves me to a different country every 2-3 years. Perfect opportunity to see the world while having a home to settle into and a circle of friends to keep me grounded. I realized this year that I was traveling more than you do which is a huge reversal from when I started following your blog. I’ve been doing this for decades now (currently nine, two-week trips to the EU from California per year) and the one thing that’s become much worse is my declining patience when things go bad like excessive flight delays, cancellations, missed connections, hotel hassles, strikes, etc. Not sure why that is, perhaps when young, I was ignorant of how bad these events could end up and with years of experience behind me, I now know how bad things can get and I can’t clear ghost of bad flights past, when things start going sideways. Actually, jet lag has become less of a problem since I’ve been flying Business Class in the past four years – good onboard sleep makes a huge difference. I’m looking forward to retirement in a few years when I only take a few flights a year. But if I’m being honest with myself, I think I might miss it. Enjoy your new life on the ground. Do what feels good, Lucky. Listen to your body (including the heart). As a fellow recently 30-year old, I totally get it. I used to love flying as much as possible. You make a good point that the anticipation of the trip is almost as good as the trip itself. I find that, to fuel my addiction, I always need to have a trip planned. If I don’t have any upcoming flights booked, I get nervous, but as long as I’m looking forward to a future trip, even if it’s 6 months away, I get my fix. Truer words have never been said! I can understand feeling heart ache leaving your dog who doesn’t know if you are coming back. Heck, my dog has had a charmed, good life (never been in a shelter and we are the first and only owners) and I feel bad when I have my friend come dog sit him for two weeks at my apartment when I’m gone! Where do you leave him when you go on trips? Benjamin Schlappig is a writer first. It sounds like the dog needs to book a ticket and bring you along as an emotional support human. You want kids???!? So essentially, you want to have the children of someone else’s to essentially satisfy your own craving wanting a human pet. It’s not like you’re going to be able to pass down your genes etc. – that all ends with you. Hmmm, personally I wouldn’t want gay parents – mainly because I like to speak to my mum about certain things and my dad about certain things. Humans are inherently geared to that without being taught it. One of the best posts you’ve ever written – I know exactly how you feel. @ Sam — Yes, I’d like a kid (or kids) in need of homes. You do realize there are over 400K kids in the US in foster homes? I’m sorry that you think it’s better to have no parents than gay parents. Maybe you can go talk to your mum and dad about what has happened in your life to make you so bitter and close-minded? By the way, science doesn’t support your argument about gay parents, but then again, I’m guessing you’re not big into science. Are you okay with two gays adopting a dog, or should we have just left him in the shelter and let him wait for a mum and dad too? I love posts like these. It’s an insight into who you are and it’s great. Love your blog and love these nontravel related posts as much as any travel review (which believe me, I’ve used to determine where to go, countless times). This sentence is incredibly relatable — and I think relatable to a lot of gays since there seem to a be a disproportionate number in the airline / travel / points & miles world (definitely not all introverted). It’s fascinating. Hi Ben – Thank you for sharing this heartfelt post. I wish you continued happiness with Ford and Winston. All the best! As long as you’re happy, that’s great! I love travelling and similar to you, hoped to get a job that required travelling back in the day. Well, now I’m in my mid-30s and to this day I still have yet to take a business trip. I’m actually ok with it and from talking to friends who travel a lot for work, I’m happy where my own path has lead me to. BTW, It’s really thanks to your blog that I’ve managed to fly in premium cabins throughout the world since 2012 (the year I started reading your blog.) You’re a great writer. Thank you. Winston is so cute!! I have felt the same way since adopting a pup. He gets so sad when i bring out a suitcase and I miss him so much when I am gone! I am going to try and do road trips more and stay at hotels where my husband and I can bring our furry friend. My name is Jez and your life has inspired me in many ways. In just 53 days, I will be graduating from college. I’ve been quite overwhelmed lately because this is a really big transformative time of my life. I feel like the next part of it is very uncertain and not because I don’t know what I want to do, deep in my heart, I already know. I guess it’s mostly because that next door hasn’t opened quite yet. In 2000, I boarded my first flight when I was just a five years old in the Philippines and that same feeling of thrill, wonder and excitement looking out that DC-9 window never left. This summer, I interned at Southwest and logged 90 flights in 12 weeks and despite all the traveling, flying never felt routine. Every time the plane took off, it felt the same way as it did 19 years ago. I guess I love it so much because of the same exact reason you shared above. It is an escape because as gay introvert, I never truly felt like I fully belonged somewhere else. I know I want to work at an industry that gives me the opportunity to travel. With all my heart, I know I want to be at an airline. When I interned this summer, there was not a single moment where I dreaded going to work. There were so many things that I knew about the industry yet many more things that I didn’t…and that felt like the perfect balance. I loved the newness of every weekend, looking at the loads and the destinations I could travel with friends. I loved the common passion for aviation from the people I met, which made me feel less weird about myself. I loved how even though my family and I moved 8,000 miles away and my life was always defined by constant change, the only thing that really didn’t change was my love for my mom and dad and my passion for aviation. As I wait to hear back from all these positions from all these airlines, I feel scared. Scared because this is the first time in my life where I feel like the next step is sort of undefined…even though I already know where I want to be. And I guess that’s what make it scary…because what if it doesn’t happen? I really don’t see myself anywhere else. Despite that, at least I know that much. I think figuring out where you want to be is half the battle. Thank you for being one of my inspirations, even though I have never really met you. I hope I can be half as successful as you and not just logging as many miles and earning as many points, but also the other parts which seems to what makes life worth the journey. I have no regrets about my career. I make a lot of money, have good flexibility, get to spend a lot of time with my family. So I find myself with teenagers looking at their futures, it has been fun to help them see they can realize their dreams. Travel was my dream, specifically flying, yet no one encouraged me to follow that path. I’ve been careful to help my kids have faith that their dreams can be realized, even to one son who wants to fly in the Air Force and then commercially. So while I’m pleased with my life (and the leisure travel I’m able to afford) there’s a tiny piece of me that wishes I had flown. But that tiny piece has only motivated me to help my kids reach what they want! @Lucky, a very refreshing post. I hope you count your blessing. You have a lovely husband, cute dog, a joyful home, and exciting career. You have special connection with your readers that most blog doesn’t have because a post like this. Like me, reading your blog is part the routine. I always wondering what we you are going to say next. So thank you for sharing this part of your life! And that’s when I started properly educating myself about miles and points. Travel definetly does become tougher as you get older. I have a 3 1/2 week trip coming up going clear to the other side of the globe and im already tired just thinking about it. Moving every 2 to 3 days is just exhausting, but when i travel that far i still want to maximize what i see and do. Still i think the day may come when i shorten trips further (i used to do a month or even 2 to 3 months at a time) and only focus on one or two destinations. Hey Ben, I had no idea you were my age! I love reading your blog and gain much insight from it. I’m glad to hear your updated perspective on traveling. Completely agree with you – when I was young, I wanted a job where I traveled all of the time. I’ve done that, and while it was fun, and took me to many faraway places, I’m glad I don’t travel like that for work anymore. I still travel enough, but not at the pace I was. I just wish I could get myself off the status hamster wheel. Keep up the reviews, and the shade on TPG. Excellent post. One less tiring way to travel is domestically on short-haul daytime routes. Not as exciting as long-haul first-class, but still fun. Nice post! It’s fun to watch you grow and change. I wait until the last possible moment to get the suitcase out. My dog immediately begins to panic because…he knows. Hiding under the bed, lying down under my desk, or standing on the patio and refusing to come back inside knowing that I won’t leave him out there. The hurt look on his face as I walk out the door chokes me up every time. Happy for you!! Cute dog. Lucky. You don’t enjoy flying anymore because almost no airlines or PR teams would give you extra perks anymore. You’re nobody now. Back when I was still in the industry I was working in DFW, JFK, IAD and STN – back and forth more often than I care to remember. The way I fixed it for my pup was to find a house sitter – not just a friend that would stay with him once… but someone that was compelled to stay at the house every time I left town. For me it was finding someone with roommates that looked forward to some alone time and really needed the cash. With the house sitter in place, Sammy (my four legged mini-me) always had continuity – he never felt alone and he never was left at a kennel, dog-spa, etc. It changed everything. 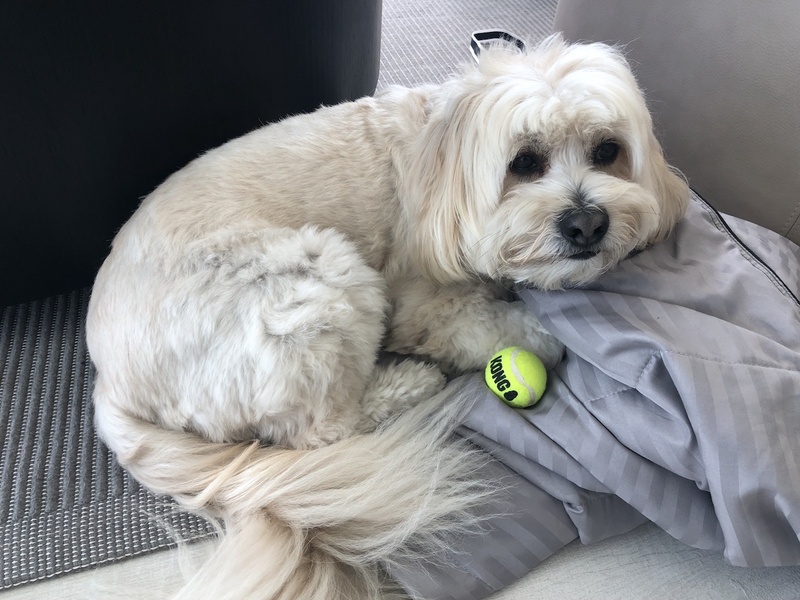 In terms of leaving your beautiful and loving dog, I still can’t understand why you would choose Ritz Carlton’s new cruise vessel for your cruise, even one of you is able to receive a travel agent discount. It’s itinerary isn’t new to you are particularly exciting in terms of reaching places difficult to reach other than by ship. Ritz Carlton’s target market is definitely age 50+ (despite what they might otherwise say). The ship will not offer a cultural environment different from the bland concept of deluxe offered by Ritz Carlton hotels. I could understand your taking a PONANT cruise to Antarctica, as that would be a new & exciting destination on a deluxe small ship known for great food & service. Or, say, a cruise to the Galapagos (other than on Silversea). I would urge you to reconsider. @Liz – Did you wake up on the wrong side of your broom this morning? Bitter – table for one! Ben, I like this post very much. It’s a personally written, honest, differentiated and cute article. Congrats! I’m about 20 years older and had the same desire to fly as a teenager. However, at that age, as well as in my 20s, I flew perhaps once or twice a year, usually for my main vacation trip. Only at about 35 I started flying more often, because I both changed job and got promoted rapidly – which meant that, all of the sudden, I was flying often for work and increasingly also in business class. 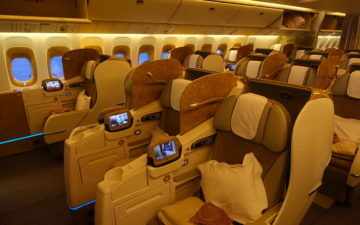 I also could afford flying business class for my leisure trips, thanks my the higher salary. And I still very much enjoy traveling, both for work and for leisure. There’s only one big difference between you and me, which might explain this: I don’t have a dog (or any other domestic animal). I had a dog as a teenager and I really love dogs – and perhaps one day, I will have one again and this might actually change my desire to travel as well. A final remark: I hope your wish to have children comes true for you and Ford. I’m obsessed with the idea of sharing a dog with someone in an entirely different household. Like…finding someone who is my dog’s second family when I’m away? (Saying this as someone who doesn’t yet have a dog but desperately wants one.) Is that a crazy idea? Welcome to the “getting older” club. To use the dumb cliche’, “been there, experienced that.” Perfectly normal, priorities do change. One day the fire is there, the next day the fire is out. So now with all your worldly smarts you can continue to share, and enthuse, other folks in a direction they might not otherwise consider because you have set an example for them to follow: patience, perseverance, and “drive” to explore a dream, achieve, and succeed. Yours is a job well done. How it continues in the future is unknown because you don’t have the “addictive” focus. A new chapter has begun …… Enjoy It !! I’m glad you’re happy about the changes in your life. My husband and I have been together 35 years. During most of that time I was a flight attendant for an international airline, and only home 10-14 days a month. Fortunately my husband owned his own company and threw himself into his job when I was away. Now we are both retired and agree we’ve never been happier. We are together almost 24/7 and while we both loved our careers, we love even more not ever having to be apart. People want different things at different times in their lives. Kudos to you for recognizing your need for a change and moving forward. Take your dog with you in First, like a true Diva. I’ve noticed myself slowing down as well; there are just points in your life where its the logical next step. Congrats on finding a new “normal” — I know I still get the urge to get on a plane, but its less frequently than it used to be. I went through the same thing you are currently experiencing. My solution was to quit my career and take a customer service job with an EWR-based airline. It’s demanding and doesn’t pay much, but I’ve never been happier. Have 2.7 million BIS miles with United…but the reality became clear. Sleeping at home every night with my husband and 2 labradors is amazing. Happy to chat with you if you are curious about a career change! the good old day when ben complained any slight delay to AA twitter team and they responded within seconds and bumped you up for no good reason. are you sad no one at AA recognizes you anymore, ben? Thank you for sharing this, Ben. A very thoughtful post, and I can relate to everything you have written. It seems you have been very lucky (no pun intended) with how things have turned out professionally as well as in your private life, so make sure you are able to enjoy it! And little Winston is so cute, by the way! PS: Your response to @Sam is the response of the year! Ben, you are a good dog dad ! After ten years of living in Miami, the cold, rude, heartless people have turned me so sour that I am leaving. Same with so many of my classmates from college, not including those who left right after graduation (aka most). Don’t get me wrong, it’s an amazing place to live, but it is definitely filled with its share of problems. Here’s to hoping you guys make out better! Ben, as a longtime reader of this blog (I still remember the old layout from the beginning of omaat! ), I am so glad and proud to read this post. You’ve been an inspiration through the years, and my heart is full knowing that you are living a happy, wholesome life with Ford and your dog 🙂 thank you for everything through the years! Funny you write this as I am having a thirst for travel. My previous job kept me flying very often, mostly to the Caribbean and Central America with an occasional jaunt to Colombia. The European travel was all leisure. Yes the weekly visits through Miami immigration could be daunting (and it was), but I do miss it dearly. I love being home, but have to admit that I miss that constant visit somewhere else. Even though most of the places I would go to were repeat visits, I miss the places, the first class upgrades (AA ‘used’ to have nice service out of Miami), the tarmac boarding in the islands, the food, the people, and long days. I complained a lot when I was doing it, but have to say it was awesome. Now I’m nearly grounded taking only trips for leisure. It was a nice break for two years, but have to admit I’m getting the itch like you had. For about 10 years I traveled to a different city every week for a 4 to 5 day client engagement. If could have been anywhere in the world. I loved it. I’d wake up , look out my hotel window, and think “I’m in Berlin, or New York, or Muscitine Iowa (not everyplace was glamorous) and someone else paid!”. Then I stopped traveling and worked from home for about 5 years. I missed the travel. In the past 6 months I’ve been traveling again, this time one to two cities a week for 2 day client engagements. I’m tired. All the time. I miss my bed, and my dogs, and my husband (not in that order). I used to get on the plane and feel a thrill. It didn’t matter where I went as long as I went somewhere. I still get a thrill, but I’m more interested in a nap. You have articulated a lot of how I feel about travel now. I think you’ll be a great dad. When you decide it’s time, do it. Good luck(y). What else has changed? How about the crackdown on manufactured spend by credit card companies. Not acknowledging this other, very real element of your and other travel bloggers’ recent slowdowns strikes me as disingenuous. Your blog is focus on travels and points.And if you share your thoughts of cultures or events it usually won’t end well. But after all these years.More or less you have become a friend of your readers.At least a friend-like.Maybe you could share some of your life here to make this blog more intimate.Don’t get me wrong.I mean the dog is part of your personal life,right? So maybe you could add a homecoming section of your travel reports.Maybe a picture of the sky when you are driving home,or a picture of the happy dog,or a picture of the dinner you and Ford have in your town.This will be the dessert of your reports. Priorities change lucky especially when you’re not single anymore. The attractive people are not available anymore either. Also better to watch Housewives from the couch at home than on the plane in some camel country instead afraid of being arrested. thats the EXACT reason why I never want to own a dog. The thought of leaving him behind for a trip would break my heart since I love dogs WAY too much. I feel ya. Also dont think I wanna have kids. I just want to enjoy travelling the world with my wife and having fun with nothing holding us back. btw cant believe youre 29. ur waaay more mature than ur age. and well travelled. truly lucky guy. Speaking of changes…remember when rather than being concerned about what champagne was served onboard, Lucky’s biggest frustration was being served lemons but not limes in his soda? Also, remember when this site had a “pic of the week” and we had to guess where it was from? Great article lucky! Stay healthy and safe travels ! I am curious as to why travel and points bloggers are disproportionately gay? I wonder if it has anything to do with feeling like not fitting in as Lucky describes. I’ve been concerned about your lifestyle because so much flying can’t be healthy. I’m glad to read this post! One reason I enjoy reading your blog is because it’s so personal. Thanks for sharing! It is good that you are pulling back from the last minute random trips. That lifestyle is just going to wear you down. I hope that this means you will continue to do reviews on the trips you do going forward. I enjoy reading them. Frankly, I hope this does not mean you will focus more of your time on posting and hawking more credit card ads. I know this is how you fund things but I find the greater focus on that content cheapens the quality of your site. Also, the miles and points component of the credit cards is what makes everything we buy more expensive, so there is that too. Good for you Ben, Balance is the key to a happy, healthy life. What a great personal post. This is why I have followed you for so long. Do what feels right Ben and I’ll still read the posts of Lufthansa first class or an occasional trip on TAAG. Well done. Mature beyond your age – it is always amazing to meet people that understand their own drivers and act upon them (and allow for the change in drivers). And a change in drivers is inevitable and sign of healthy awareness of oneself and the environment. Some things can only be enjoyed at certain times. Running through Beigin after 14-hour flight? Sure, if I’m 20. Nailing that major project and looking your product used by hundreds of people? Sure, when I’m 30. Explaining the point behind Michelangelo’s David to a teenager? Sure, when I’m 40. Sitting contently, quietly next to spouse sipping coffee and looking at a stream of sunshine dancing on the coffee table? Sure, when I’m 50. Just be happy you recognize what brings you joy and you are able to act upon it. @lucky, too many comments to read them all, so apologies if I’m repeating. I’d bet you money there’s a significant amount of maltese in your cute Winston. And I agree. I used to travel happily to unglamorous places to be on a plane and keep my status. Now I’m happy to stay home — went two months without getting on a plane from mid-december to mid-february — and to travel to places that I want to go. Deciding this year to be a free agent has been wonderful as well. I have a bunch of travel coming up, but it’s all where I want to go on the airline I most convenient for the trip — so far, DL, AF, AS and AA. Can’t wait to try AF first instead of another boring AA first trip. Looking at this Qatar fares right now! Also, I feel the same way when I leave my pets even though I have someone who comes in to stay with them who is great. Ben, I have been reading your blog for many years now. You are the greatest expert on the subject of travel, miles and points. Thank you for sharing your experiences. You have my deepest appreciation for who you are and what you are doing. I appreciate and respect your candor. It’s a comfort to know that there are individuals who understand and care. Wishing You, Ford and Winston the best. You and I are about the same age. I have been moving country to country since the age of 3 months so I am not sure that I can relate to your recent sentiments since I have known no other. The difference between our travel is that I usually spend at least a few months in a new country – I enjoy the destination and the culture more so than the journey getting there. Best of luck to ya. You deserve it man! Thank you so much for your trip reports. They have helped me in travel planning a lot. Once you turn 30 your body slows down just a little bit 🙂 it is just nature. You have dedicated your life to your passion, and that is extremely admirable. Enjoy being together with your husband! That doesn’t happen every day. All the best and thank you for your blog. I met you at a couple of frequent flyer events, I believe I even ate with you at a group table. I am 68 now. Traveled like crazy for my law enforcement career and racked up the points and miles and got into the game. Retired at 57. Found I could still play the game without all the business travel. When my wife and I travel international trips, and sometimes long haul domestic, we always fly business or 1st on points. But, the travel in itself has become harder and longer than the old days. Travel in coach is just a real trial. We have 2 dogs and a cat and we have a pet sitter who takes them to her house, so they think they are on vacation. It helps. But, it is still sad leaving them. You are not old Lucky!!!! I am getting old, not you! @ Ben — I am genuinely happy for you! I knew you would come around. I’m right there with you! I’ve been traveling and somehow missed this post, now being a few days late idk if you’ll read it. Congrats on your newest family member. I can totally relate to having a heavy heart leaving the fur-baby at home. When our boy was alive, he would absolutely hate seeing suitcases being brought downstairs. And, upon our return, he’d give us the cold shoulder. Oh… and in his final few years, he had two Hawaiian Airlines Business Class quilts: one for the sofa and one for the car. Enjoy spending life with Winston! Ben, you are a much better person than I! After reading Sam’s post I would have deleted the post and banned him from the site! None of us need his imput! On the other hand, I loved the advise [email protected] gave! Instant chuckle! But I have to admit the person who shocked me the most was Debit! Not the response I expected! Could it be that deep down Debit has a heart? Who knew? Proud of you Debit! Good job! So it took Ben almost a decade to learn that he could pimp credit cards from home just as easily as from a hotel. Even a slow student can eventually learn the lesson. Burning out on constant travel is nothing new and certainly not revelatory. Ask any consultant for one of the major firms. Your history of regularly leaving behind a dog with serious abandonment issues screams that you are not ready for a child, certainly not the adoption of a foster child. Does your focus on a healthier lifestyle include a serious analysis of your penchant for drinking while traveling? I hope that it doesn’t take another decade for you to learn that a life well-lived is much more about giving, helping and sharing than chasing self-gratification. The attacks on someone basically due to sexual orientation are a comment on the poster. Lucky, thank you for sharing. Hate to tell you, I am a the other end of the (age) spectrum, and, it does not get any easier with our pets even on short trips, which is what we mostly do. You are very generous in sharing with us, and, those of us who “get it” will be forever grateful. This post really resonated with me as well. I’m at a similar phase of my travel career, likely because I’m roughly the same age as you, started posting on FT around the same time as you (although not nearly as frequently, ha), and have very similar travel preferences. My travel life progression has basically been a much smaller scale version of yours, from your 5 TPACs in 4 days am I crazy? days (for me it was mileage runs to SBN), to gaming UA’s customer-friendly IRROPS policies, to developing an irrational fear of turbulence that took surprisingly long to get over, to obsessing over the exact moment LH/CX/whoever would release close-in F space, to collecting FCT ducks, to discovering Amans, and finally to getting to this place where travel is all of a sudden a means to an end rather than so much of an end itself, it’s been fun to watch you grow and change in the same way I feel like I have as well. Congratulations Lucky. As a gay man in his 30s, introverted as well, with a son (IVF) but that travels much, much less than you, I was happy to read about your new life journey. It’s great to see so many positive comments you’ve received.